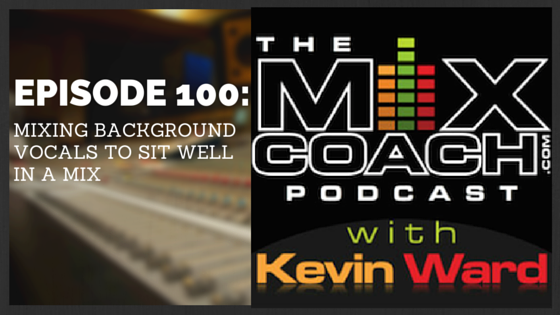 On this episode of the podcast we take a question from one of our MixCoach Pro members during a recent Q/A webinar who asked about how to mix background vocals to sit well in a mix. We touched on tips and tricks that we use for getting BGVS and other instrument to sit right in a mix. Check out this episode to learn more! Pair like parts together and balance the first pair in context with the mix. Add in each additional pair one at a time, and balance them together in context with the other parts in the mix. Use multiple layers of automation if needed. Route the BGV or vocal track in question to an Aux track where you can add another layer of automation if needed. Sometimes putting your compression on this Aux track is useful because it allows you to ride the level of the original vocal track into the compressor, to help it react more efficiently. The MixCoach Podcast takes both submitted questions from our free Members, and live questions from our Pro Members, if you would like to submit question or would like to find out how to become a Pro Member head over to MixCoach.com/Free. If you missed the last episode Click Here! Previous Post Jack Joseph Puig and Martin Bomer Next Post Working on some new content for our mixers at mixcoach. Come join us if you’d like to mix!